Home > stories > Scenic Bikeways Video Release Party! Scenic Bikeways Video Release Party! We’re really excited to announce an event with TravelOregon, Chris King and Basecamp Brewery to release the latest Scenic Bikeway videos. As many of you may know, we spent the better half of last year riding and filming the amazing Scenic Bikeways around Oregon. We’ve been spending the colder months editing the footage and they are all done! What is really special about this event is that we are having proponents from each of the Scenic Bikeways at the event! That’s right, the local advocates from Central and Eastern Oregon are making the long trek out to Portland to be at the event. So if you are wondering where you should stay in John Day, where you can find an IPA in Heppner or are curious about local gravel rides out of La Grande, then come to this event. The local proponents know their towns and surrounding areas intimately and are a great source of information about riding and recreation around the area. Also, there’s beer from Basecamp and some awesome snacks coming out of the famed Chris King kitchen. You don’t want to miss it! Here is the Facebook event link and the nitty gritty details below! 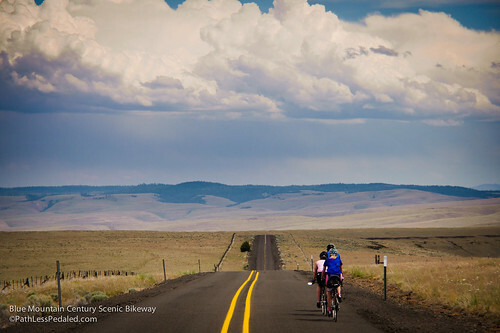 Did you know Oregon has Scenic Bikeways!? That’s right, we are the only state in the nation with Scenic Bikeways – offering Oregon’s “best of the best” road biking routes. For one night, Travel Oregon is bringing the Oregon Scenic Bikeways to Portland! They’ll showcase the short, inspiring Bikeway videos by The Path Less Pedaled – including three new ones never before seen by the public. Intros will be led by the filmmakers, Travel Oregon and Bikeway proponents. Tasty bites will be served by well-known chef Chris DiMinno, and Base Camp Brewing will provide fresh-brewed libations. This event is free with donations encouraged for the Oregon Travel Philanthropy Fund.